The Cybex 600A Arc Trainer has previously been voted "Best New Product" because of the revolutionary and intense workout it delivers by combining elements of a climber, crosstrainer, and cross-country skier in one easy-to-use, low impact machine. Total Body Experts continues to receive exemplary feedback in the form of rave reviews from both club members and owners alike who are in awe of the simple design, the comfortable gliding motion, the user-controlled speed, and the vast range of resistance available on the Cybex Arc Trainer. Cybex is known for its innovative and ongoing research in the areas of physiology, biomechanics, and anatomy, and the Arc Trainer was developed from this passion and pursuit. The 600A boasts superior biomechanics designed to transmit the least amount of stress to ankle, knee, and hip joints, while maintaining the highest level of performance, and footplates that incline along an adjustable arc of motion in a bilateral, reciprocal movement, which provides a smooth exercise experience. A resistance range from 0 to 900 watts accommodates a wide variety of users, from novices to the most dedicated athletes, by yielding a lower work rate and relaxed feel at low resistance levels, and providing high intensity training, with greater muscle loads, at higher resistance settings. 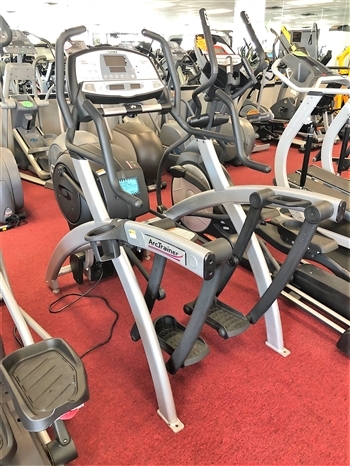 Whether it's in your club, office, or home, the Cybex 600A Arc Trainer remains to this day a durable, innovative, and essential machine that continues to stand out among others in its class for design, performance, and results.